The way that Minecraft renders blocks has changed significantly for 1.8. Previously, the shape of blocks was defined in the java code. This meant that (for example) a BlockTorch would always have the same shape, and only the textures could be changed. Minecraft now uses model files to define both the shape and the texture. To skip straight to some sample code, see here. By default, the filename is the block name- for your custom blocks this will be the name you provided to GameRegistry.registerBlock(). Useful vanilla examples to look at include blockstates/cobblestone, bed, and dark_oak_log. NB - by default, minecraft looks for a blockstates file with a filename that matches your block name. You can customise this if you want - for example, a different blockstates file for different block variants, or ignoring one of the properties in your IBlockState. See here for more information. is then used to provide the instructions for rendering the block in its current state. This link does an excellent job of describing the format of the block model files. 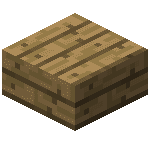 Useful vanilla examples include models/block/stone, acacia_log, bed_foot. A cuboid is defined by specifying the 3D coordinates of two opposite corners, “from” [x,y,z] and “to” [x,y,z]. A full cube such as a block of stone uses [0,0,0] to [16,16,16] - so for example [8,8,8] is the centre of the block. One or more quads are then defined from the faces of that cuboid – for example, in half_slab.json shown below, the faces are defined using the cuboid from [0, 0, 0] to [16, 8, 16], i.e. a slice 8/16 units high. This is repeated for all the cuboid “elements” in the model - most models only have one cuboid element, but there can be many - for example the stairs has two - the bottom half slab and the quarter cube "step" on top. The stairs model is made up of two cuboid "elements"
Each quad is covered with a texture. The UV coordinates correspond to the texture specified for the quad, in the order [u1, v1, u2, v2] – where [0 – 16, 0 - 16] corresponds to the full texture [width, height]. In the example from half_slab.json below, the down and up faces both use the full texture, but the other faces (east, west, north, south) use only half the texture. Note that the v coordinate in texture [u,v] coordinates is “upside down”, i.e. [0,0] is the top left corner, not the bottom left corner as you might expect. So in the example below, the half slab extends from y=0 to y=8, and the texture corresponding to this range is v=8 to v=16. The order of the coordinates is important; if you flip them around, for example [16, 0, 0, 16] instead of [0, 0, 16, 16], then the texture will be flipped left-right. Quads are only visible from one side - for example, the east face is invisible if you are standing behind it, i.e. looking towards it from the west. The “texture” field in elements must be a variable texture such as “#mytexture”, and you must define “mytexture” in one of your “textures”: fields. You can’t use the texture directly, for example the model file below will give you a missing texture on the down face. // the down face texture will not work! For further explanation of quads and texturing used in Block Models, see here. Cullface quads might not be rendered, depending on the adjacent block; minecraft will call Block.shouldSideBeRendered() to see whether it should render this face or not. For example, BlockGlass overrides shouldSideBeRendered(), and returns false if the adjacent block is also a glass block - see the picture below. The “cullface” value specifies which direction it points in. In contrast, non-cullface quads are always rendered. Cullface quads use lighting brightness (ie sky light and block light) taken from adjacent blocks – for example the east face of the block being rendered at [x,y,z] takes its lighting brightness from the block at [x+1, y, z] i.e. located one position to the east. In contrast, non-cullface quads use lighting brightness from the block being rendered. The “ambientocclusion” flag turns on/off ambient occlusion when rendering this block. Ambient occlusion is a way to improve the appearance of lighting and shadows, see here for more information. Generally speaking, ambient occlusion is suitable for full blocks, but not for small or complicated shapes such as a torch or grass. The “tintindex” flag is used for faces which get a colour from Block.colorMultiplier() to modify the rendering colour – for example used by grass to change to a brownish colour in drier biomes, or by redstone wire to change the wire brightness according to the power level. See here for further explanation. The “shade” flag is used to control lighting. If false, it turns off the direction-dependent face brightness (i.e. the up face is drawn brighter than the down face). See here for some background info on lighting. 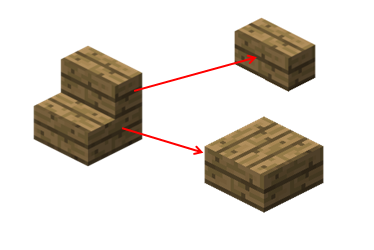 The “particle” texture is the 2D representation of the block, used for (eg) the flying block particles when the block is broken, or the view if the player is inside the block. Vanilla has a set of “built in” blocks for which it doesn’t look for models, such as BlockAir, BlockChest, BlockStaticLiquid, defined in BlockModelShapes.registerAllBlocks(). It also does an awful lot of messing around in BlockModelShapes.registerAllBlocks() to define which properties of each block affect the rendering. This doesn't appear to be necessary for Forge-registered blocks. Any idea how to convert a .obj to a .json file? Hi. I'm not familiar with .obj files, but given how restrictive the minecraft block model format is, I think in many cases it won't be possible to convert an .obj to the block model. I haven't tried it but I've heard good things about it. You might be able to import obj (and export minecraft block model) with it. Hey TGG, I've finally gotten around to upgrading some mods to 1.8. I'm pretty comfortable upgrading the Java stuff, but I have to say that converting to BlockPos, IBlockState, and these JSONs is pretty tedious. Anyway, I think I understand the JSON concept -- a JSON that maps the block states to models, and then models that map to textures based on conditions of what is being rendered. However, my effort is failing with "model definition not found" errors. I have a thread here (http://www.minecraftforge.net/forum/index.php/topic,28211.0.html) that shows my asset structure, JSON file content and other related code. I'm pretty sure it is just some typo, or wrong folder structure but I've been looking at it for days with no success. Can you take a look? Nevermind, I solved it. In order for me to avoid typos I used unlocalized name in several places. But forgot that the method for getting the unlocalized name appends the "tile." or "item." to the name -- I hate that because I like setter and getter methods to be symmetrical. Anyway, adding a .substring(5) to each fixed that. Actually, still having some problem with this. I can get item textures to work fine, but blocks still have the pink and black checkered default texture. Even a pretty simple block. Do you have a github repository of working code I could peek at? Just need a block with working texture. Hi Julian Yeah I feel your pain, it's very hard to get it right first time and tracking down why the texture is checkered isn't so easy. Try MBE01 for a very simple example. In the console, the debug statement prints out indicating that this code is run. There is no complaints at all in the console about missing models or textures. The block item in the creative tab is a pink and black checkered default texture, but when placed in the world the block is invisible (you can see the bounding box if you hover and it casts some shadow as expected for that block). I was able to take your code and get blocks to render. So now I just need to work through and see what's wrong with mine. Definitely thanks for giving me a reference point! Okay, finally got it working. I had two problems going on, first one was a cut and paste error where the block states json was actually pointing to another non-working json. Secondly, this block was supposed to be translucent but it seems there is some subtle changes to the way that works in 1.8 -- for example there is some EnumBlockLayer.TRANSLUCENT that needs to be implemented. Sorry, need help again. I've successfully created several blocks that are full blocks, with orientable parent. Now I'm trying a more complicated shape -- in this case it is a tanning rack that has two posts and a plane between them. I want the posts to have a wood texture and the plane will have a leather hide texture. Any ideas? I understand the concept, but I must have a type or am missing something. Do I need to specify a parent? (I tried that but it makes the model into a full block). Can someone tell me the problem? The particles are displaying the null texture. Thanks. Hi. Try asking the question here, there are lot of helpful folks that can give advice. does anyone have the block texture for a torch?